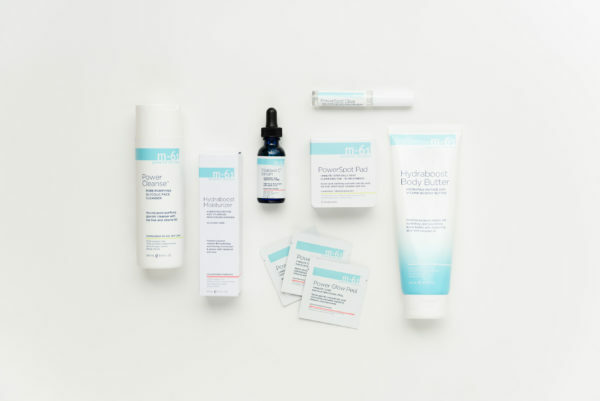 I’m always so shocked when I’m talking skincare with someone (you know, as one does 藍) and they aren’t familiar with Bluemercury’s M-61 skincare line. It’s honestly one of my favorites! I feel like the products and ingredients are such high quality, especially for the price. We’re not talking drugstore prices by any means, but we all know that some skincare lines can be ridiculously priced. I truly feel like you get so much bang for your buck with M-61! I’ve tested a lot of their products over the years, but these are my top five favorites… Well, seven, depending on the season. Power Glow Peel Pads | I’ve been using these Power Glow Peel Pads for what feels like forever now… at least a few years. The skin on my face is fairly sensitive and when I was getting a facial a few years ago, my technician mentioned that I had a two broken blood vessels on my cheek. After I realized those weren’t reversible , she recommended that I opt for more of a solution-based exfoliant instead of a harsh scrub. I don’t use these every single day, but I’d say I use one 2-4x a week depending on how my skin is doing. (You definitely can use them daily, but !) You’ll notice a difference right away! And actually, I think when you first start using them and getting your skin used to the active ingredients, I think I started at once per week and worked my way up. They have made my complexion much more even and radiant! Vitablast C Serum | When I was shopping in store last summer, they did a demonstration showing just how well this product works. They had an apple cut in half and on one half, they applied Vitablast C Serum and left the other half as-in, exposed to the air. The side with Vitablast C had not oxidized hardly at all, and the other side was getting more brown by the second. While I would say that my favorite Vitamin C product is probably still the Kiehl’s Line-Reducing Concentrate, this one is a great option and a totally different consistency. The Kiehl’s product is great for daytime use if you aren’t layering a bunch of products… It’s a thicker product, more like a lotion than a lightweight serum. When I am using Kiehl’s, I pretty much just cleanse, use the product, and then moisturize. 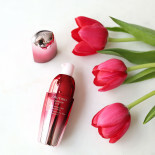 But if you’re layering more products, you might want to look into this M-61 Vitamin C serum! It’s super lightweight and I could always notice a difference, which I cannot say about all Vitamin C products I’ve tested out over the years. Power Spot Clear | If I’m good about my skincare routine and washing my face after I sweat, I’m lucky that I rarely breakout.  BUT sometimes I’ll accidentally sleep with makeup on and wake up with the start of a pimple, or sometimes get one that pops up right around that time of the month. I love the Mario Badescu Drying Lotion just as much as everyone else, but if you’re *not* trying to go to bed with pink dots all over your face, this gel (that comes in a very tidy lip-gloss-like tube) is where it’s at. I love that you can wear it during the day, too! Power Cleanse | I typically only use this cleanser in the summer when I feel like my skin needs more of a deep purifying, but this cleanser is the bomb dot com! Brilliant Cleanse | In the cooler months, this cleanser if my faveee! It does a great job of gently exfoliating (just with ingredients, not scrubs), brightening, and not leaving your skin too dry. So good! Hydra Boost Body Butter | I’ve said it before (I think on Insta Stories), but I always thought I wasn’t necessarily brand-loyal when it came to body lotion… until I tried this stuff. IT. IS. THE. G. D. BEST. It moisturizes like nobody’s business. And it opened my eyes to the fact that we should be putting at least a tenth of the time and effort into the skin on our bodies that we do our faces. Ya knowww? Power Glow Body Butter | The only other re-texturizing body lotion I’ve used is the Dermologica one and I have to say, this one is definitely my favorite! This is literally NOT SPONSORED. You know I love skincare and this is just a brand a genuinely love (and purchase myself). Bluemercury products are great aren’t they. I’ve never tried the body products or cleansers. Only the serum’s. I’ll have to broaden my spectrum.